“That’s the way he was. 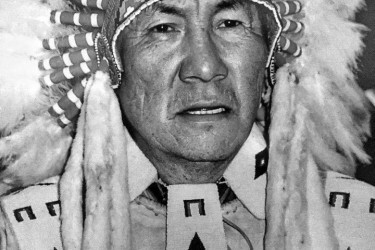 He always felt responsible for those around him,” said son Lee Crowchild. “Even after he was no longer the official chief, he helped everyone, and the old people considered him their forever chief. Even after he got sick they referred to him that way. The Tsuu T’ina chief of the small community next to the growing sprawl of Calgary had his political battles cut out for him during the tumultuous years between 1970 and 1976. Provincial officials were pressuring him to approve an extension of a ring road that would route Calgary traffic through the reserve. Like his father before him, Chief David Crowchild, for whom Calgary’s Crowchild Trail was named back in 1968, Gordon did not claim to be a warrior, but he stood for what was right and just. Gordon was also challenged by the early 1970s rise of the American Indian Movement. Several members crossed into Alberta from the United States, boldly occupying the administration office in the Morley townsite of the Stoney Nakoda First Nation, just west of Calgary. “My father joined other Treaty 7 chiefs to stop the occupation and get everyone to safety. He told the AIM guys he supported what they did and how they awakened the spirit of the people, but violence was not the way to do it,” Lee recalled. Crowchild was fascinated with the dynamics of peace-making and travelled to Belfast during the height of the civil war there looking for solutions for peace. He went on a pilgrimage to Sarajevo with a number of his peers during the Balkan war. “When the Gustafsen Lake Sundance in B.C. was being occupied, he drove out there by himself and went right into camp to support them, but asked that they don’t use violence,” Lee said. Speaking at Gordon’s funeral on Jan. 7, 2015, attended by 900 people, Tsuu T’ina Chief Roy Whitney credited the former leader with bringing economic development and training programs to Tsuu T’ina youth. It was under Gordon’s watch that the prestigious Redwood Meadows Golf and Country Club and housing community surrounding it was developed. Powwow grounds were added later. “He instilled a mindset in our people to strive for opportunities, allowing them the ability to enhance their lives for not only the betterment of themselves and their families but also for the community,” Whitney said. The room erupted in laughter but Gordon finished the point he was trying to make in all seriousness. “He told them ‘what I mean is you have to bare yourself, so to speak, when you’re working for the people. You can’t hide anything from the Creator’,” Lee explained. Born in 1929, Gordon grew up watching his father David compete in the Calgary Stampede Rangeland Derby. It wasn’t long before he entered his first rodeo competition in the boys’ steer-riding event in 1944 and later fulfilled his dream of becoming a chuckwagon driver. In 1955, he experienced an accident that ended his chuckwagon career and almost took his life. “They raced in all kinds of conditions back then and my dad was outriding. There was so much dust my dad’s horse stepped in the basket hanging at the back of the wagon in front of him. They both went down. The wagon behind was being driven by Rufus Goodstriker (a well-known Elder who has now passed on) and he hit my dad’s horse and just clipped my dad. He was laid up for quite a while after that, but his horse saved his life,” Lee said. Never one to quit, Gordon continued steer decorating, steer wrestling and wild horse racing even into the 1990s. He competed at the Canadian Professional Rodeo Association (CPRA) and the Pro Rodeo Cowboys Association (PRCA), and was known for helping many young and upcoming cowboys live their dreams. Professional cowboys sought him out at the Calgary Stampede ‘to share a story or two’, according to a news release. He was inducted into the Canadian Professional Rodeo Hall of Fame in 2005. Gordon was 85 when he passed away.